Looking for a great way to sneak in veggies? 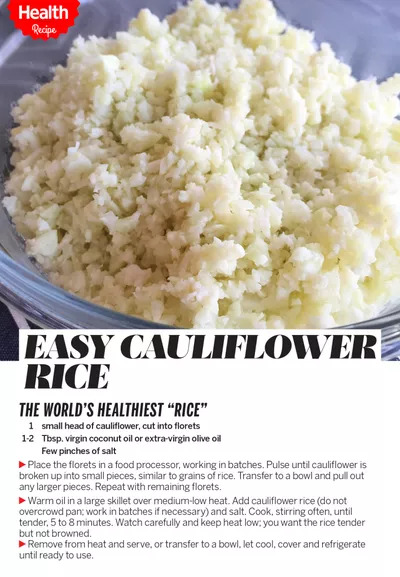 Here's how to make "rice" out of cauliflower. Just how hot is the phenom of “rice” made out of cauliflower? With nearly 28,000 posts on Instagram featuring #cauliflowerrice, it’s safe to say this dish is trending hard. It’s tough to say what the best thing is about it. Among its advantages: It’s made from one of the healthiest cruciferous vegetables you can get, so it’s loaded with nutrients including fiber, vitamins C, K and B6, and potassium. Cauliflower has 25 calories per cup vs. 218 for a cup of cooked brown rice. (And, if you’re watching carbs, cauliflower has 5g per cup vs. 46g for a cup of brown rice.) Cauliflower rice is easy and fast to make. Plus, it’s crazy-delicious. Seriously. It’s that simple. One pound of cauliflower will yield about 4 cups of “rice.” Use it to make fried rice, or alongside any dish you would normally have with regular rice. Don't forget to pin this recipe for later!